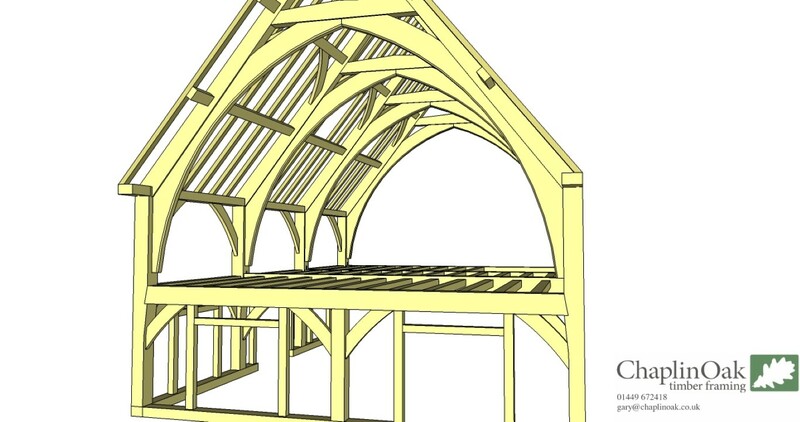 Two storey ‘open truss’ arch brace design frame. This frame was designed as additional living space to a barn conversion, to accommodate a downstairs library and upstairs bedroom & bathroom. 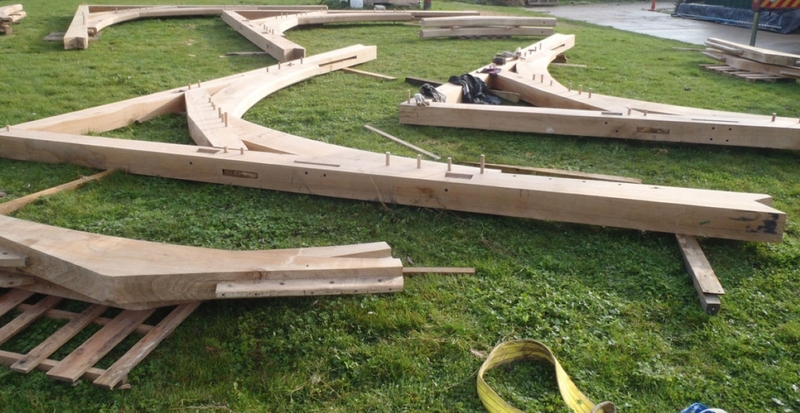 A width of nearly 7 metres and length of 10 meters makes this a large frame considering the truss design. 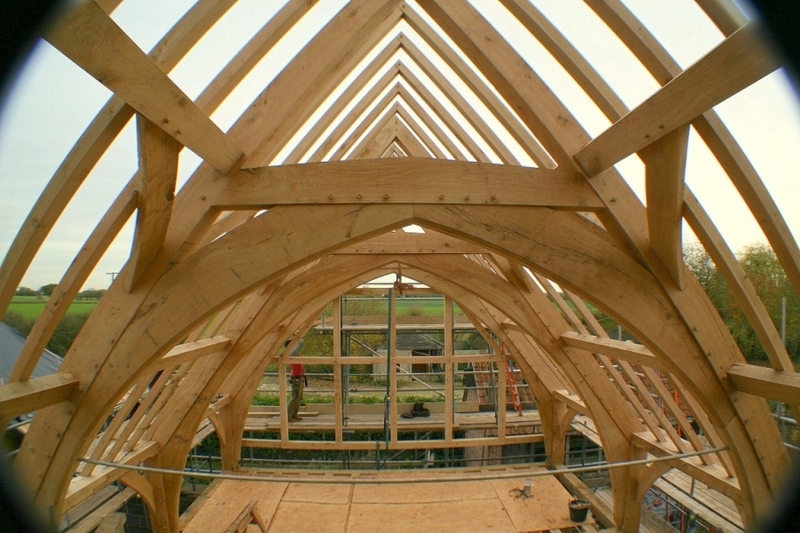 The client wished to have the majestic cathedral like qualities of this style of frame to contrast the very utilitarian barn, yet maintaining continuity by using traditional timber framed construction. 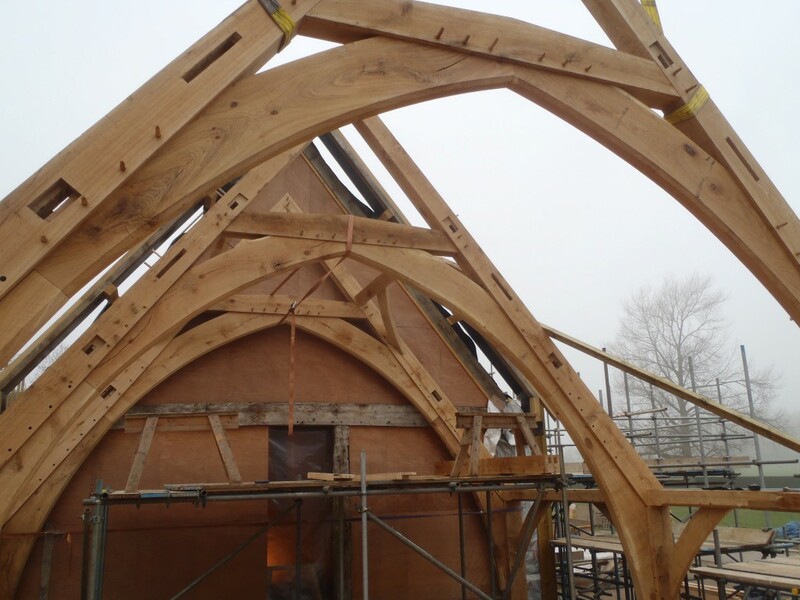 At a very early stage it was clear that an experienced oak frame structural engineer would be required to ensure the correct balance between aesthetics and technical requirements could be achieved. Simply put, the arch brace design is not the greatest of designs with regards to structural integrity. After multiple revisions of designs the plans were submitted for structural engineering approval. With some clever use of complex tension resisting joinery techniques and the addition of hidden metalwork it got the all clear and construction could begin. 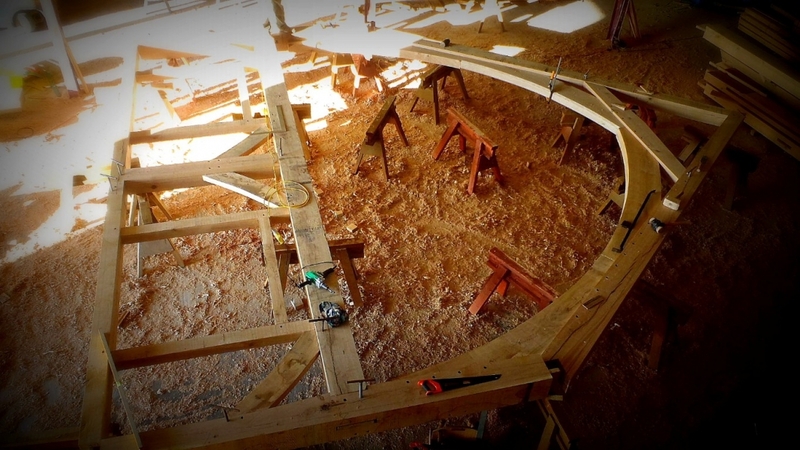 One of the most challenging hurdles to overcome was sourcing the ‘slab’ material that could yield the quality curved timbers that would become the arch braces themselves. These would need to have a deflection of 200mm over a length of ~2.6m. Given there are 16 of them, that’s quite a challenge. Here’s a pic showing a few that have been blanked out in preparation. Manufacture of frames like this usually begins with the long walls, the following picture shows one side mid-layup in the workshop. An interesting feature in the posts is the inclusion of first floor jowls. The timber flares to accommodate the large cross rails and improve jointing at this junction area. Long wall, laying on studs for scribe work. 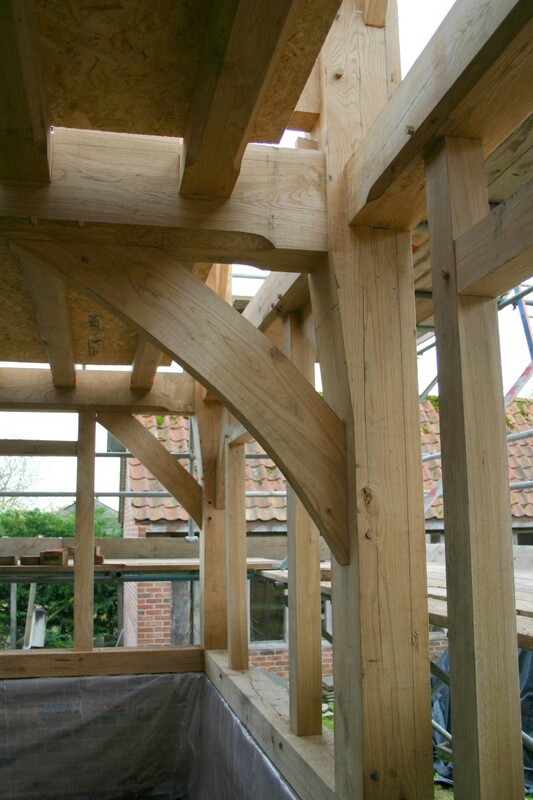 Storey post showing jowl and dovetailed through tenon. Each of the four cross-frames will be under a great deal of stress as the trusses are pushing the posts apart at the tops. Normally this is resisted with the provision of a tie beam. The next available position to resist these forces is the mid-rail, which is approximately 1.8m below the wall plate. Because of the leverage, the tension forces are amplified and stresses this lower joint. By using a fully housed, counter-wedged dovetail through tenon (that’s a mouthful! ), these forces are hopefully contained. If you look closely you will see this detail in the above picture. 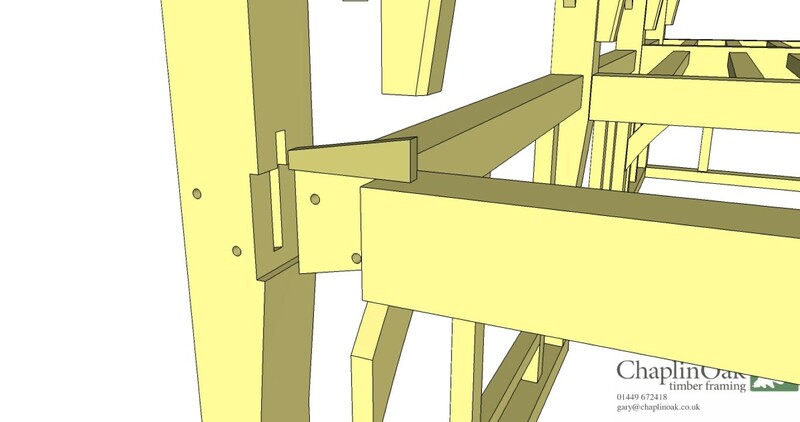 This jointing technique alone was not deemed sufficient (by the engineers) to tie the frame together, so within the central cross frame an additional steel rod was needed, which in time will be hidden within a stud wall. 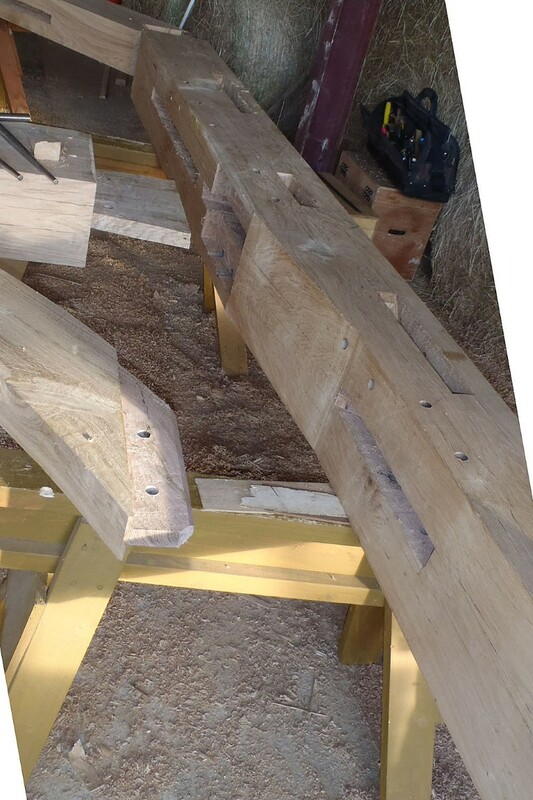 Each of the four arch brace cross frames were next layed-up. The full arch brace design, where each brace touches end-to-end is one of the most challenging designs to construct with precision. There is no scope for error and re-cutting. 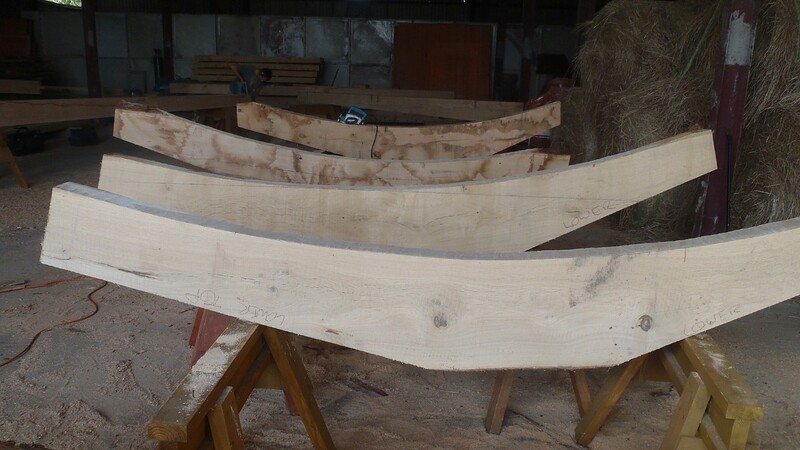 Although hidden from sight, each of the arches has a mortice and tenon end to end to limit twisting. 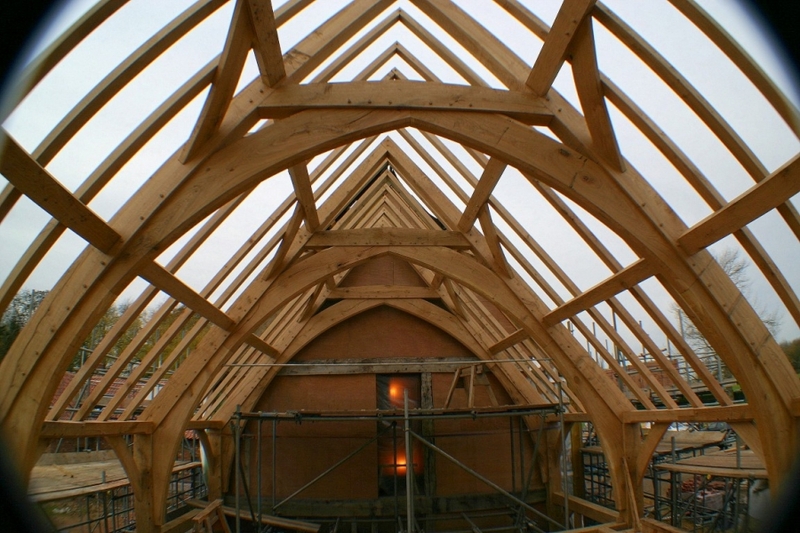 There don’t seem to any pictures of these apart from some evidence can be seen in this image of the trusses just before raising (look top left). The individual components are all marked up using an ancient and unique numbering system, loaded onto a truck and taken to site. Utilising a massive crane, we were able to assemble this structure in a matter of three days. 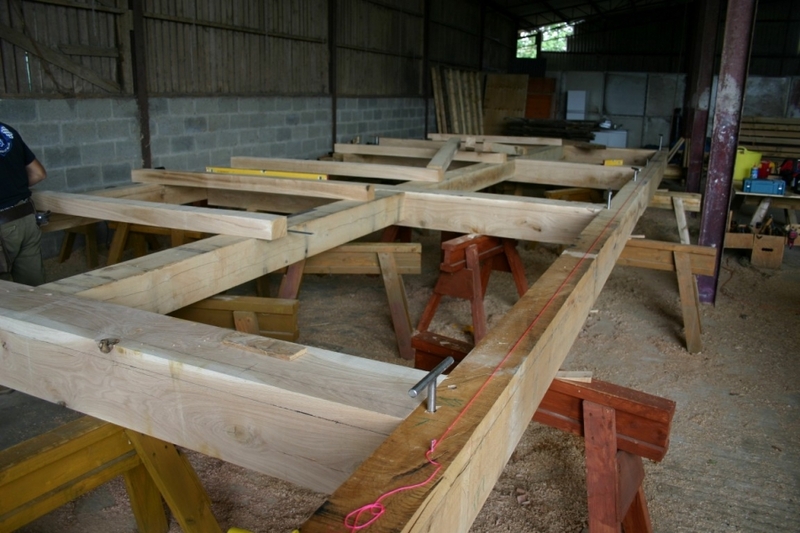 Assembling frame, third cross-frame before inserting purlins. The library on the ground floor. First floor jowl, adjacent to bookmatched brace (matching one on opposing side). Looking towards the barn. 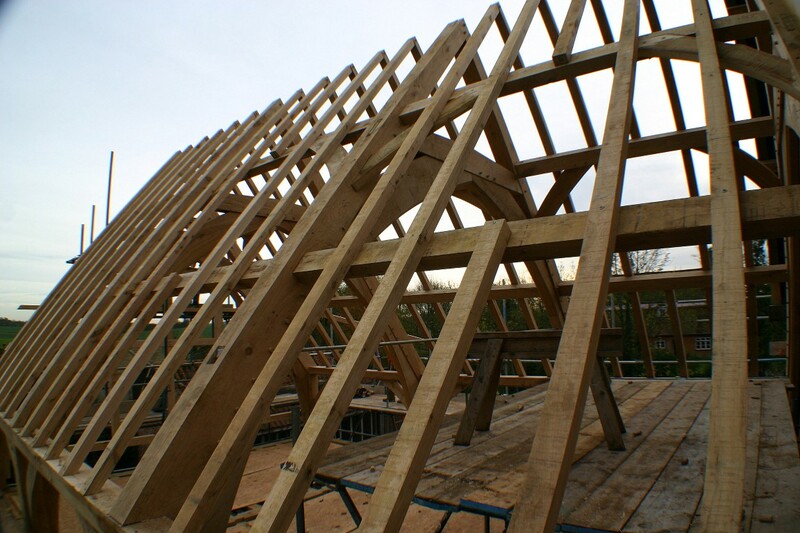 Fully braced double purlin roof. The openings are for velux windows, perfectly spaced so the reveal detail works out correctly. North view. The gable has an additional window support framework applied to the outside. 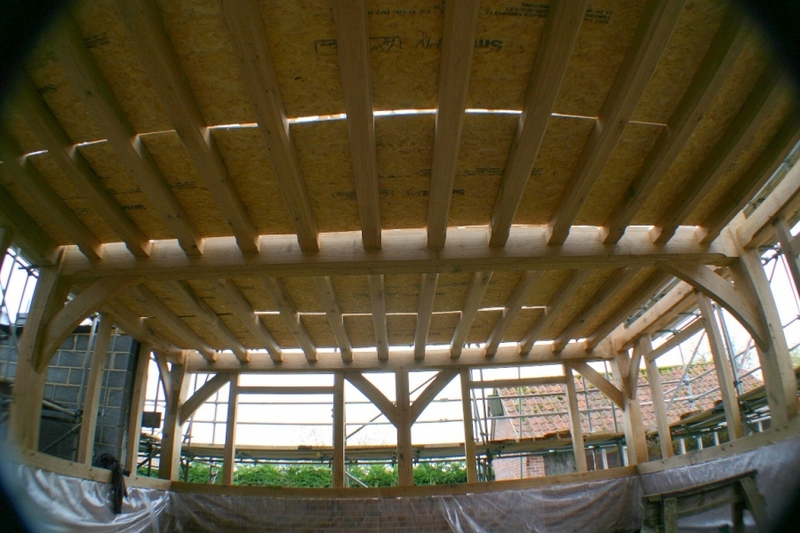 This Will support the direct glazing as well as providing additional support to the frame.